This page is a collection of Air Force, Air Force Reserve, Army Air Corps, Army Air Force, Air National Guard and Civil Air Patrol related photographs whose content exists online. Orders, correspondence, citations et cetera would fall within this category. If you know of any such sites online, send me the address and I will add a link. If you have such a photograph send it along by email and share . B17 Rose of York Being Christened by Princess Elizabeth 'rechristening' plane re-named in her honor at Thurleigh on 6 July, 1944. These photos courtesy R. Adsit who obtained them from a family friend, a Mr. McFarland, presumably a veteran, who had them with his stamp collection. 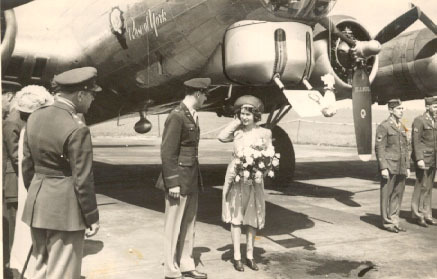 Ed Gregory (Rose of York crew chief with story on event), Sgt1/C, 367th Sqdn, 306th Bmb Grp, 8th AF, USAAF Click here for photo of the King and Princess, here for the Princess Christening the Plane, Here for the Princess and the Officer. The Online DC-3 Aviation Museum A Webpage about the DC-3, C-47, R4D aircraft with Photos.